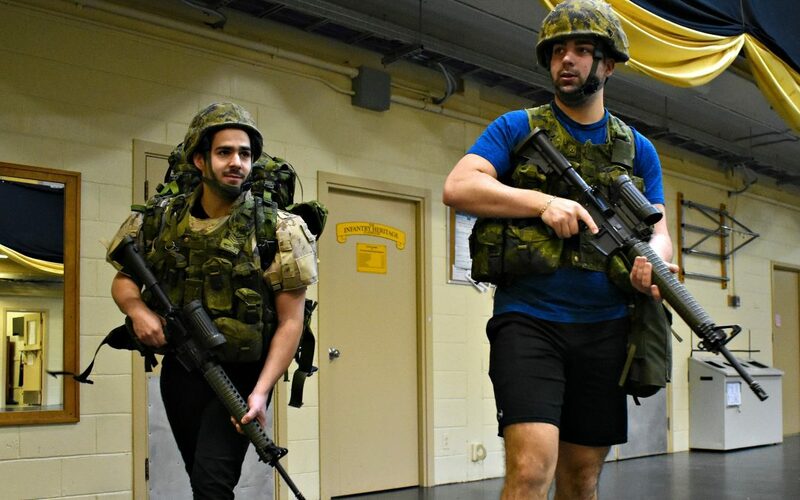 Ben Aitken, from left, and Colin Kelly are put through their paces at the Queen Charlotte Armoury. Marching drills, a sandbag drag, carrying at least 60 pounds of gear, are part of basic military training, but for a performer? It’s fair to say generally, no. 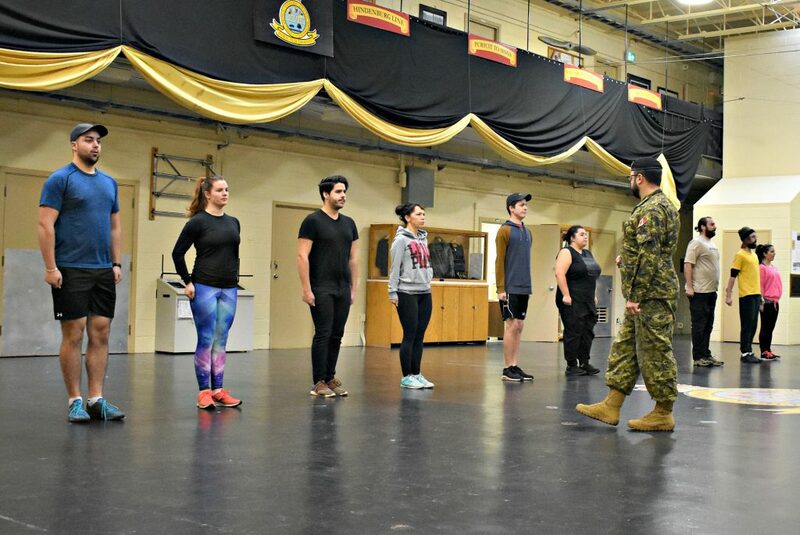 That is unless you’re in the Feast Dinner Theatre, where cast members were put through their paces at the Queen Charlotte Armoury on Friday morning. “For me to go into the same place as someone I am portraying is incredibly helpful. You get to see the way they stand, hold their heads, it’s so specific, and important to be in this environment,” said Sherri-Lee Pike, playwright of the latest Feast musical comedy called ‘Twas the Night: Christmas in Kandahar. Most civilians would never notice these subtle signs of a military service member, but Feast is known for its meticulous attention to detail and impeccable research that goes into every production – it’s one of the reasons why it celebrated a milestone mark of 40 successful seasons this year. Feast cast members chant in cohesion, “Left, right, left,” while following the orders of Sergeant Justin Vincent, from left, and Aviator Craig Court. “Through this training the actors can understand how precise they have to be for their characters because you can often pick out an officer in the crowd just by the way they interact and hold themselves. It’s a different world, but I have so much respect and admiration for the military,” said Pike. 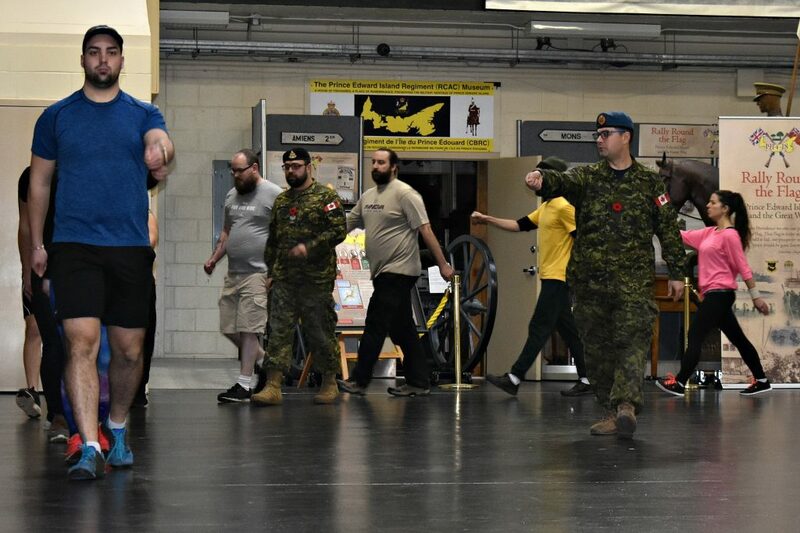 The cast from Charlottetown and Summerside stepped into their character’s shoes and chanted in cohesion, “Left, right, left,” while following the sharp orders of the drill sergeant. Sergeant Justin Vincent said the cast were taught the core army values such as teamwork, respect, loyalty, duty, honour, to name but a few. “Mentally they (drill sergeants) put you under stress to push yourself better, and physically, you can see the demands just in the Force test,” he motioned to the exhausted cast that had just completed pulling more than 260 pounds over 20 metres, without stopping. Feast Dinner Theatre cast learn quickly to fall into step at military boot camp. ‘Twas the Night: Christmas in Kandahar is in part a tribute to the military and entwines the 100th anniversary of the First Word War. The production will support Summerside’s Brave and Broken initiative, with all revenue from tickets going to the non-profit organization on Wednesday, Nov. 21. The Rodd Charlottetown will join forces, with all their proceeds going to support the P.E.I. Military Family Resource Centre on Tuesday, Dec.11.